To be the best rural hospital in Texas by focusing on quality, managing an accountable organization and recruiting, retaining and educating outstanding staff. Welcome to Childress Regional Medical Center! CRMC is a full service rural healthcare facility located in the southeast corner of the Texas panhandle. Our staff is committed to serving patients with the highest quality healthcare possible. We achieve that by using technology, superior skills, and up to date knowledge combined with a compassionate touch. As the only clinic in the county, which is designated both medically underserved area (MUA) and health provider service area (HPSA), we take our obligation to provide patient access to primary care services seriously. We’ve expanded clinic hours to the evening (Monday-Friday) and weekends (Saturday from 9am – 3pm & Sunday from 1pm– 5pm), and we are developing a patient centered medical home program to better serve patients. 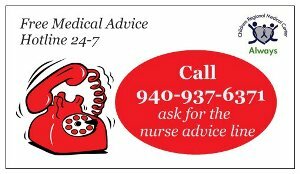 Call (940) 937.3636 or use the patient portal to make your next appointment, check on a prescription, or contact your provider. Our commitment to the people of Childress and the surrounding communities is to provide the healthcare they need to the fullest extent possible. When the care needed cannot be provided locally, CRMC works with your doctor to find specialty physicians and facilities that can best fit your needs. The hospital has transfer agreements with hospitals in Amarillo, Lubbock, Wichita Falls and Altus, Oklahoma. We want to take care of you and your family and we want you to have the very best care possible. Extended clinic hours for walk-ins only.